Incidents of mass fainting in factories have been alarmingly frequent in Cambodia’s economically vital apparel and footwear industry in recent years. In 2017, the Cambodian National Social Security Fund reported that some 1,603 workers had fainted while working. Other widespread incidents of mass fainting in export factories occurred in 2011, 2012 and from 2014 to 2016. The sector, which employs over 700,000 workers, 90% of whom are women, is the country’s number one export industry. 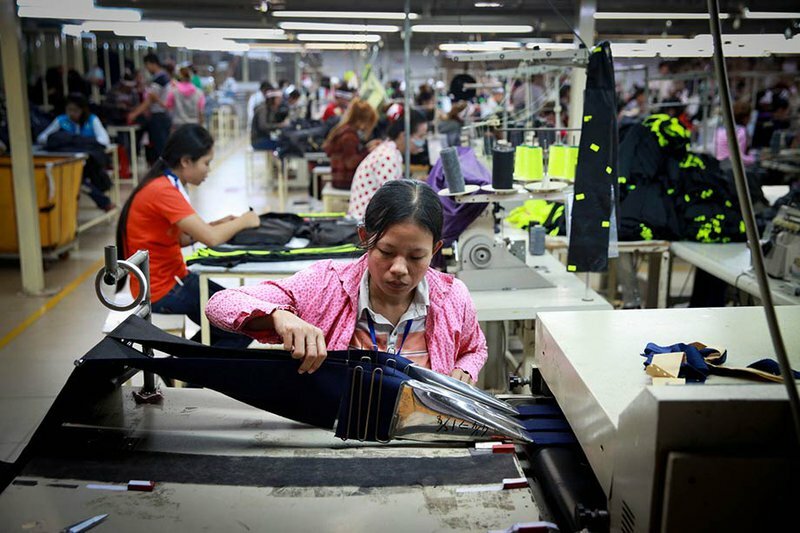 Major apparel and footwear brands from Europe and the US source their products from Cambodian suppliers, largely motivated by the low cost of labour. Factory owners have tended to attribute the mass faintings to external causes, including chemical fumes from pesticides on nearby farms. One such incident that occurred at the Hung Wah Cambodia Garment Manufacturing factory in Phnom Penh in 2011, in which 236 workers fainted, was attributed by provincial police to chemicals used “to prevent cockroaches from eating garments”. In other past incidents, factory managers have characterised fainting as “mass hysteria”, suggesting that panic grips the other workers when one worker falls ill. On other occasions, the faintings have been flat out denied. After 100 workers at a garment factory producing for H&M were hospitalised in October 2011, in what workers and union representatives described as a mass fainting, a spokeswoman for the brand initially stated that no fainting had occurred. Rather, “workers felt stressed after unfamiliar sounds from an exhaust fan.” She later clarified, saying “it seems to be mass sickness, rather than mass fainting, since workers reported to have felt weak, dizzy and nauseous”. Cambodian labour rights groups point to harsh factory conditions as the main factor for workers fainting at their work stations. The Centre for the Alliance of Labor and Human Rights (CENTRAL) – a 2018 recipient of the International Labor Rights Forum’s Labor Rights Defender Award – has been systematically tracking, documenting and investigating incidents of mass fainting at apparel and footwear factories, and advocating for the rights of the workers affected. Members of CENTRAL recently met with nearly 60 of the workers who fainted at the Starite factory to interview them about what happened. In their accounts, the temperature at the factory was extremely high, and that the facility was lacking in mechanical ventilation, relying only on windows for fresh air. Who’s responsible: the factory or the brand? One aspect that often gets overlooked in the analysis of the root causes of mass fainting is the complicity of the brands themselves in creating the conditions for excessive overtime, unreasonable production targets and deadlines, and poverty wages. They do this through their own business and purchasing practices, yet because of the buffers between them and their suppliers they are nearly always able to displace blame elsewhere. A study conducted by the International Labour Organisation (ILO) last year found that purchasing practices by brands in supply chain industries – and especially in the textile, apparel and footwear industry – had direct, negative impacts on working conditions and workers’ rights in factories. These root causes of poor working conditions include short lead times for orders; last-minute changes in product specifications; unilateral requirements for supplier compliance with social and labour standards; and, most significantly, the ‘price squeeze’, or the prices paid by brands to suppliers that are too low to even cover production costs. The labour rights violations that result from suppliers adapting to these demands include poverty wages; poor health and safety conditions; irregular working hours; excessive and mandatory overtime; unrealistic performance targets; harassment and abuse by management; and lack of investment in training and proper equipment. Prices paid by brands to suppliers are frequently are too low to even cover production costs. For example, more than 50% of the factories surveyed by the ILO in the textile, apparel and footwear industry were providing products to brands at prices below their costs of production. At the same time, only one out of four buyers were reported to be willing to make adjustments in their prices in order to increase the minimum wage paid to workers. It is no surprise, therefore, that workers cannot afford to buy sufficient food to meet nutritional requirements when the minimum wage in Cambodia (the equivalent of U$170 a month) does not cover basic needs. Short-term contracts – common for workers in Cambodian apparel factories – are also a significant source of stress for workers. Short-term contracts and temporary work are often suppliers’ ways of dealing with brands’ fluctuating and unpredictable orders and peak-time production requirements. They are also an employer strategy for undermining trade unionism. The current political context in Cambodia is hostile to workers. The government has shut down democratic space, outlawing opposition and independent civil society organisations. The current Trade Union Law puts significant restrictions on workers’ right to freedom of association and collective bargaining. Representative trade unions are blocked from registering and from acquiring the majority representative status required to be able to bargain collectively, for example for higher wages and improved conditions in workplaces. Conflicts at the factory level remain unresolved, as worker access to the independent Arbitration Council has also been restricted. Some brands sourcing from Cambodia have expressed their concern to the government about these alarming developments. But, in addition to pressing the government to restore full democracy and freedom of association, the brands themselves need to examine and change their own business practices that are contributing to poor working conditions and poverty wages for the workers who make their products. These conditions, workers’ advocates say, are the real root cause of the mass faintings.